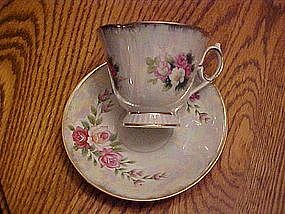 Simple and pretty china tea cup with matching saucer. 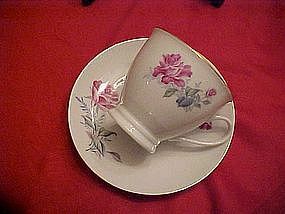 Cup has a pretty pink rose on each side that matches the saucer. Real gold trim border on each piece. Saucer measures 5 1/8" in diameter. Made in China. Both pieces are in excellent condition. A lovely centerpiece for your set of dishes. 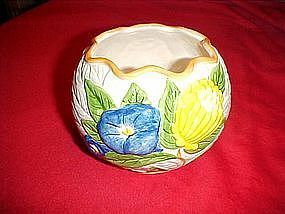 This is a 4 1/2" tall rose bowl or Ivy vase. Made of hand painted glazed ceramic by Strata group, hand painted in the Philippines. Highly decorated all over with a relief of morning glory, roses and various flowers. Perfect condition, I have other pieces to this set listed in my catalog. Beautiful for Spring decorating or to add to your set. These dinnerware pieces are very hard to find. 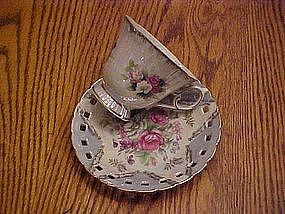 This lovely little vintage cup and saucer set is abundantly decorated with violets inside and outside the little cup. It has a fancy delicate handle and three little curly-Q feet. The matching saucer measures just over 4 3/4" in diameter and both pieces are trimmed lavishly with scrolls and gold trim.Set is made by Yada China, in Japan. 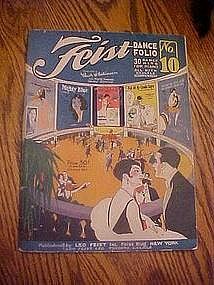 The set is in pristine condition. 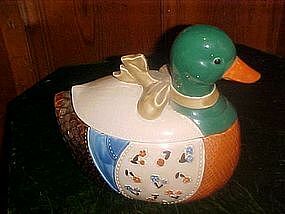 THis nice large cookie jar is made of hand painted glazed ceramic by B&D Japan. Measures 10" tall and is about 11" long. Nice and roomy to hold lots of your favorite cookies, Would be great in a vacation cabin too. Perfect condition! Interesting, 50's style angular dish. Dark salmon pink coloring with sponged relief of white and gold. (photo makes pink appear light) On the bottom you can see the bare red clay it was made from. Inscribed into the bottom it says 462 Van Nuys Calif. (C) 1958 U.S.A. Smooth glaze on the inside. Measures approx. 5" x 7 1/4" but is three sided. It is 3" deep. 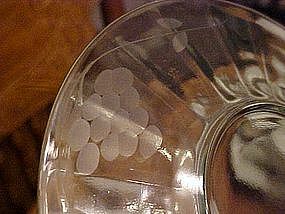 It has three small feet which are a part of the bowl. Perfect condition! 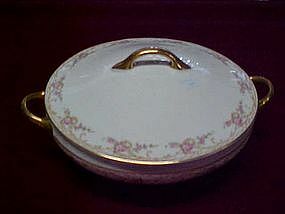 Nice round covered casserole made of fine china by Cleveland China. A23 which I'm assuming is the pattern number.Tan scroll work with tiny pink roses and vines. Heavy gold trim on handles. Measures 9" in diameter. Warranted 18 carat gold. No cracks or chips but there is normal age crazing. Pretty vintage set of the moss rose pattern on this china snack set. 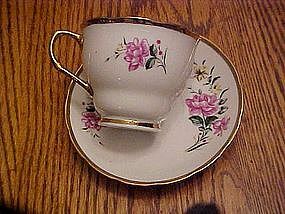 Delicate china cup with the matching shell shaped plate. Lots of gold trim. I believe this was made by CBC China. I have 2 sets. Price is for one cup with 1 plate. All pieces are in pristine condition. 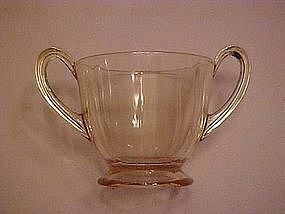 Nice fostoria glass sugar bowl in the fairfax pattern. Pretty yellow color and had double handles. Measures 3" tall, plus the handles. Pristine condition. 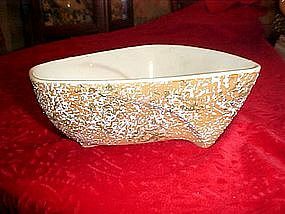 This large elegant glass bowl is made by Lancaster in the petal pattern. It measures 11 1/2" in diameter and is 5" deep at the tallest point. It stands on three curly feet. This one has a lovely cutting that is repeated three times, altering with the large petals. Not sure which cuttting this is, but very nice. A very lovely yellow color, and is in perfect condition. This was only made for a few years. 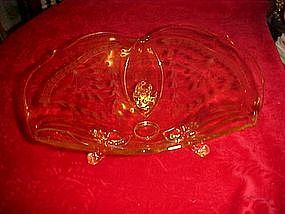 This is such an elegant vintage dish for your bath. 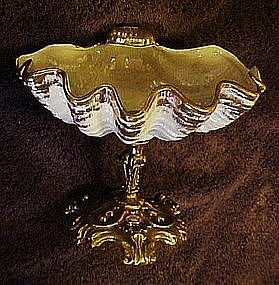 Clam shell shape bowl is made of quality lustre coated ceramic with gobs of gold accent and trim, to compliment the ornamental base pedistal. Stamped in the metal is, Style Built New York Accessories. No chips or cracks and is in beautiful condition. Measures 6" tall. How lovely this would be beside your favorite mermaid! Here we have green depression glass saucers that measure 6 1/4" in diameter. Ground glass bottom edges which make me think they are Fostoria. Perfect condition, and boy do they ever glow under the black light! I have 2 available. Price is for each. Lovely green depression glass saucers measure 6 1/4" in diameter. They have a lovely grapes cluster & vine cutting. Perfect condition. I have 5 available, price is for each. Excellent condition. Not sure who manufactured them. 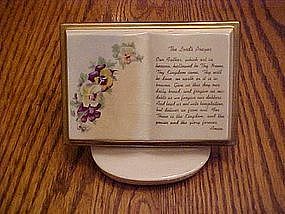 Pretty figurine of a book with the Lords Prayer, decorated with pansys and violets, and nice gold trim. Book measures 3 1/2 x 5. It also has two holes at the top if you want to use it for hanging. Also comes with the ceramic easel as shown. Both pieces are in perfect condition. 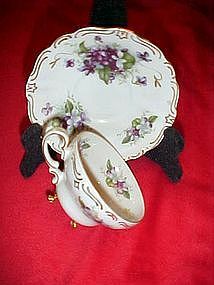 This is a great full size set of lustreware cup and matching saucer. Rich lustre finish with flower decoration and lots of gold embellishments. Cup has a fancy handle and sits on a foot. Pristine condition. Made in Japan. 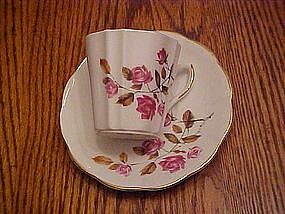 A lovely full size set matching cup and saucer with dark pink roses design. Made by Royal Vale England. 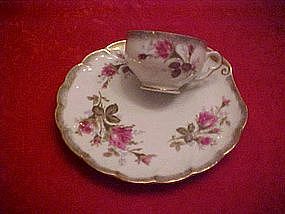 Made of beautiful bone china with real gold trim. Saucer is 5 1/2" in diameter. Pristine condition. A lovely full size set of china tea cup with matching saucer. Saucer measures 5 3/4" in diameter and has open eyelet trim with light blue, and an abundant floral design. Comes with matching cup that sits on a foot and both pieces are lustre with oodles of gold trim and accents. Made in Japan and in pristine condition.